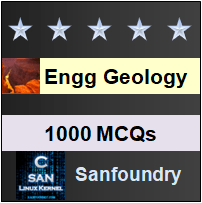 This set of Engineering Geology Multiple Choice Questions & Answers (MCQs) focuses on “Rocks as Materials for Construction – 01”. Explanation: Rock mechanics deals essentially with behaviour of rocks under applied force fields in natural as well as in laboratory conditions. Rock mechanics has developed at such a fast pace during last it has already become a compulsory part of advanced civil engineering practice. 2. Which material can be used as a roofing material among the following? Explanation: Slates used in many areas as roofing material for ordinary constructions and in pavements also fall in the category of building stones. 3. Which type of compressive strength is taken as the most important index property of stones? Explanation: Stones like all other solids fail when subjected to loads beyond their strength. The failure takes place under compressive, tensile and shear forces at different values. It is however, the unconfined compressive strength, which is taken as the most important index property of stones. 4. What is the maximum force expressed per unit area, which a stone can withstand without rupturing? Explanation: Compressive strength is also sometimes referred as crushing strength of a stone and may be defined as the maximum force expressed per unit area, which a stone can withstand without rupturing. 5. What is not true about unconfined test? Explanation: The load at failure divided by the area of cross-section of the sample gives the unconfined compressive strength of the rock. The value is termed unconfined or uniaxial because the test specimen has no lateral support or restraint and is being compressed only along one axis. 6. Which rock possesses very high compressive strength? Explanation: Igneous rocks being crystalline in character, compact and interlocking in texture and uniform in structure possess very high compressive strengths compared to sedimentary and metamorphic rocks. 7. What is the capacity of a stone to withstand bending loads called? Explanation: Transverse strength is defined as the capacity of a stone to withstand bending loads. Such loads are only rarely involved in situations where stones are commonly used. Explanation: Numerically, porosity is expressed as the ratio between the total volume of the pore spaces and the total volume of the rock sample and is expressed commonly in percentage terms. 9. Pick the stone which is objectionable for use in moist conditions. Explanation: Sandstones and limestones may show varieties as high absorption values as 10% or more. Selection of such highly porous varieties of stones for use in building construction, especially in moist situations, would be greatly objectionable. Explanation: Bulk density is the density of the rock with natural moisture content. It is assumed that in such cases all the pore spaces are not filled with water. 11. A road stone should possess sufficient affinity for binding. State true or false. Explanation: Road stones should possess sufficient affinity for binding materials to ensure stability. Stones with an ability to form their own binding material under traffic are preferred.